Exploring other food blogs is always a source of inspiration for me. I love tap-tapping on my laptop late into the night, or early in the morning when I have my coffee and all is still, surfing the ever-changing WWW-landscape, uncovering treasures at ever turn. The recipes file on my hard drive is bursting with deliciousness (and a tremendous back-log!) from all the picture perfect dishes I have picked up here and there. But I wonder how many of the not-so-perfect ones make it out here? Should we even bother putting out our less-than-stellar attempts? I think so. Once in a while I don’t mind reading about how this didn’t turn out quite the way it was expected to; or how that just seemed to go wrong at every turn. Why? Because the thing I like best about blog dishes is human on the other end – yup, that’s you! Yes, you without the test kitchen nor legions of assistants. You that sometimes produces moments of culinary brilliance, and sometimes just needs to get dinner on the table in 20 minutes after a stressful day at work. You who would love to buy organic and free-range everything, but sometimes has to make do with pre-packed flim-flam and parmesan cheese in that bright green container. My best friend K brought me back a hefty bag of Pancit Bato from her trip to Camarines Sur. After our first trip to Bicol, the magazine sent her back to do a more in-depth feature on the water sports complex at Camarines Sur. In between whipping around the cable park attached to a board, and exploring the gorgeous islands of Caramoan, she managed to get me some fresh Pancit Bato noodles. Bato in Tagalog (the Filipino dialect where I live) means stone (or rock). 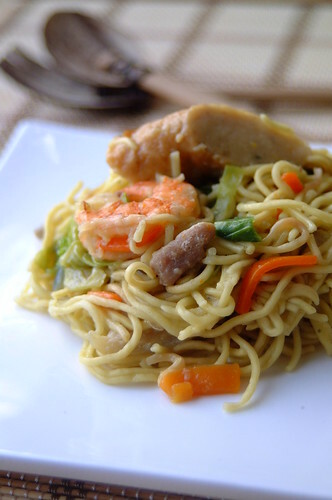 These aren’t noodles of stone tough…they are named after the town of Bato in Bicol, where they are made. After the noodles are prepared, they are baked for a bit in a pugon (wood-burning oven) giving it its special toasty flavor. The fresh noodles will only last 7 days at room temp – as K was advised not to place them in the fridge. So after their journey back with K, I was all excited to use them! K dropped them off at my place with instructions and tips, and I got to them right away. The instructions called for cooking them in water and Knorr Meaty Seasoning, then adding veggies and maybe some kind of meat or seafood. K said the one she ate had bits of pork and kikiam (the Chinese que-kiam – made of ground meat and vegetables and wrapped in thin bean curd sheets). C wanted chicken and shrimp. So I just tossed everything in – bits of pork belly, slices of chicken fillet, shrimp, and kikiam – along with some garlic and onion, and thinly sliced carrots and cabbage. Perhaps the amount of my improvisation confused my poor noggin into forgetting some basic rules: Do not over-cook noodles. Do not over-cook shrimp. Do not over-cook veggies. Sometimes we have to learn the hard way! I will use the specified amount of liquid. I will cook it al dente and not turn part of it into noodle-mush. I will add the veggies later rather than sooner. I will add the shrimp last. I have extra kikiam to eat! Who told you that pansit bato is good only for 7 days ?? The secret is to dry it in the sun. Try it next time.